You and I are sitting down having a pint in the late eighties, and I tell you that in just a few years’ time there will be machines available to ordinary guys, just like you and me. These machines will be programmable, and they’ll do the work for us. You would have either thought I had gone mad, or that I was talking about some episode from Star Trek. Well, They’re here - those machines are now a reality - and you can have one! They are called CNC machines. So, what is a CNC machine? Let’s get right down to basics. What does CNC actually mean? Computer Numerical Control. A computer drives them rather than you driving them. Think of the autopilot on a Boeing 747. The pilot programs the flight plan into the flight management system, and the computers do the rest. The result, of course, is absolute precision. Why Should You Want To Have A CNC Machine? How many times have you suffered from your drill slipping a millimeter, or a saw heading off in its own direction messing up an entire piece of wood? This doesn’t happen with a CNC machine. When you are crafting your woodworking project, there will always be a slight imperfection when sawing, cutting and drilling by hand, it is inevitable. But, with a CNC machine? All you need is to program the computer, tell it what you want to do, and it will obey your commands to the letter. With this in mind, you will grow to appreciate the accuracy and precision, particularly when you need to make more than one of something. If you make them using CNC machinery, they will be absolutely identical, meaning no more wobbling chairs, no more wobbling tables. And that can mean the difference between a full glass of beer, or a spilt glass of beer during the BBQ months which is reason enough to have the machine alone! You will also find that you have much more of the most valuable asset in our lives, time. Seriously, a CNC machine can do things in minutes which will normally take you hours or even days by hand. Processing complex cut or shape. 1. CNC Router - The most used CNC Machines by woodworkers. Forgetting all the fancy words, when we strip things down to the nuts and bolts, a router is essentially a cutter. It cuts things as well as carves and etches. Metal, wood, glass. Sometimes they need cutting into shapes, sometimes they need etching, and other times the need patterns carving into them. Have you ever seen a jaw-dropping pattern on a table or display cabinet and wondered how long did that take? ​Probably not long because it would have been pre-programmed and cut by a CNC router. It doesn’t matter how advanced your woodworking skills are if you ever try to cut a complicated pattern into a slab of wood – when making a cabinet door, for example – it’s always going to have its faults. It’s called being human, no one is perfect. Our hands shake, our phones ring when we’re halfway through the pattern, these things are unavoidable. We may not be perfect, but machines are! They have no emotions, they don’t need tea-breaks, they just sit there and get on with doing what they’re told to do, and the CNC router is a case in point. You will get that perfect pattern you crave, as well as the fact that it gets done in a fraction of the time it would take you to do the same job to a lower standard. As well as the practical advantages of CNC routing such as precision, time saved and perfection, there are many advantages to you personally. No more having to wear dust masks, no more having to hold a vibrating machine for hours on end, and it’s a lot safer too! 2. CNC Milling Machine – the master of the pack! A Milling machine drills, shapes, cuts away excess materials, polishes, buffs and smooths. It really is the Simba of the workshop tool inventory. Whereas the CNC lathe and CNC router are great for multiple numbers of the same piece, the CNC milling machine is more geared towards one-offs. With the right CNC milling machine, you can make just about anything, such as a spare part for your car, for example. You could describe it as a more robust and mechanical version of a 3D printing machine. Now, because the CNC lathe is so versatile and can do so many things, it can take longer to carry out its task. Don’t get me wrong, it’s still going to do things in a fraction of the time compared to you doing it by hand, but, some jobs can take longer. An advantage of having a CNC milling machine over the old-fashioned kind is that you can walk away and do other things while it’s doing its thing. Buying a CNC milling machine doesn’t come cheap, I’ll be honest about that. However, if you are running a small business and selling your products, you will recoup the initial layout cost over time. Because you can make ten of something in the same amount of time you would normally make one with a manual machine you can sell more, and due to the drastic cut in time which the machine will be turned on, you will also save in electricity costs as well. Yes, it’s a big initial investment and commitment, but you will thank yourself for the decision in the future. 3. CNC Lathe – Making perfect legs every time! Take a piece of wood, metal or plastic, place it onto a spindle, hit the green button and the bit will start spinning. You then have two wheels to worry about. One of them moves your work left and right, the other out and in. It’s like the old tap your head four times and your belly three times in exactly the same space of time. In other words, not easy. We’re all mostly familiar with horizontal lathes, but CNC lathes can also be vertical meaning they take up a lot less space in your workshop. CNC lathes are a great tool to have if you need to have multiple amounts of the same thing such as legs for a table or chair. A leg which is just a millimeter shorter than the others means that you’ll be folding and stuffing bits of paper underneath it, which is annoying, to say the least. The thing you should be looking out for with a CNC lathe – or any kind of lathe for that matter – is the quality of the clamps. Firstly, the material on which you are working can slip meaning there will be mistakes and imperfections which puts to death the whole point of having a CNC machine. Secondly, cheap clamps can bite into the material. This is particularly relevant and important to you, a woodworker, as many woods can be soft compared to metals of plastics. The CNC lathe is a fantastic piece of kit to have, but just make sure you’re getting the right one which suits the work which you will be asking it to do. And remember, don’t try to save a few dollars on cheap clamps! You are now getting into the realms of projects which require the most intricate detail and precision. If you need a flower cutting into a piece of wood, you no longer have to drill a hole into which a jigsaw blade can be inserted, those days have gone! This is a huge advantage if you have a small business because you will be able to produce such ornate pieces which your competitors simply cannot come close to matching. One thing you’ll soon fall in love with is the fact that you don’t need to keep buying and changing cutting blades every five minutes which in the long run will save you a small fortune. Think about it – laser beams do not get worn down! With a traditional saw and blade machine, it doesn’t matter how much you spend; you can buy the most expensive machine and blades out there, but you will still have a bit of fraying on the edge of your cut which you will need to spend time smoothing down and perfecting with some sandpaper. This is not so with the CNC laser cutter. In fact, stop thinking of it as a cutter. Think of it as a melting machine! Rather than cutting along your lines, it melts away the materials along them. 5. CNC Plasma Cutting Machine – what’s the difference between plasma and laser cutting? The biggest advantage of plasma cutting over laser cutting is that a plasma cutter has a smaller kerf. What’s a kerf, I hear you ask? To put it into simple terms, if we were talking about normal cutting blades, the kerf of the cut would be the width of material removed depending on the thickness of the blade. Plasma is made up of compressed air and inert glasses which are all mixed together and forced through a tiny hole. There is therefore little heat involved compared to a laser cutter, meaning that you won’t have any brown and singed edges. Plasma cutters are used more for metalwork. 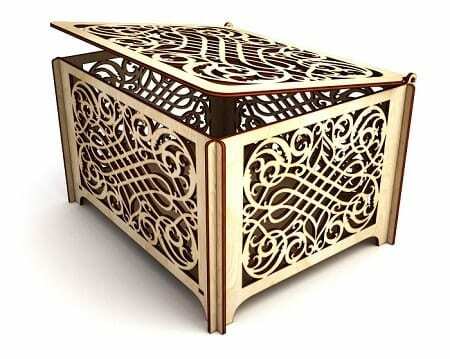 As you are going to be working with wood, the laser may be more advantageous. WHAT TO LOOK FOR BEFORE BUYING YOUR CNC MACHINE?